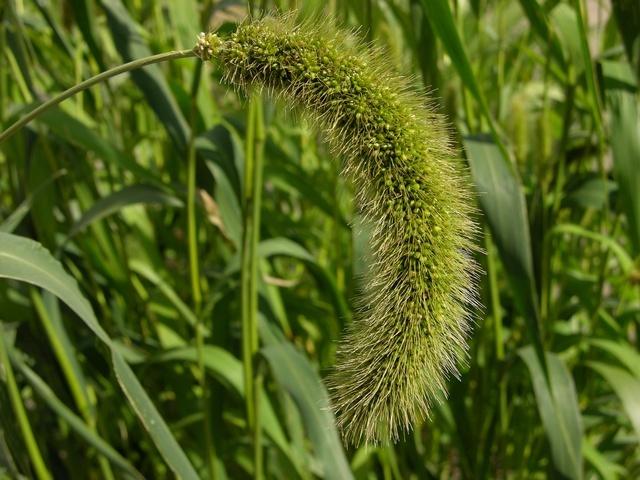 Setaria italica. JC Schou.biopix.com (Accessed 3/2017). Setaria italica is an annual, C4 grass (Downton 1971), much like S. viridis but coarser. Flower spikelets 0.3 cm, fertile lemma smooth, shining, bristles green, brown, or purplish, grain dropping free of glumes inflorescence spike wider, 10-30 cm long, 0.7-3.5 cm wide, appearing densely shallow-lobed, tip often nodding. Habitat: An old and once a widely cultivated form of S. viridis, with many cultivars (Hitchcock 1950). Open habitats, roadsides.